Welcome to the Internship survey! To return to the forums, click on "Forums" in the top right corner. You are not logged in. You can browse the survey, but must log in or Register before adding reviews. Internships are a major part of training young stage managers. The modern American theatre industry would be very different without interns. However, according to the US Department of Labor, an internship paying less than minimum wage should provide a substantial educational component. Interns should not be assigned tasks that would normally be assigned to fully-paid employees. The intern should benefit more from the internship than the employer does. The goal of this SMNetwork Internship Survey is to objectively assess and compare the quality of stage management internships. You must be a member of SMNetwork to participate, although you can elect whether or not your ratings will be publicly associated with your account. Registration is free. 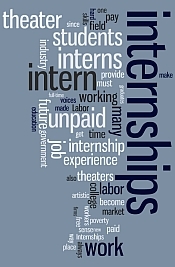 SMNetwork does not provide any judgment on the legality of internships. The ratings here will merely demonstrate how internships rank in comparison with others in our database, and allow those who are currently applying for internships to see how various options stack up against each other. If you're considering taking a internship, you can use our index of ratings from prior interns to help you determine which one will be best for you. As you read through these reviews, bear in mind that prior interns may have had more or less experience, drive and skill than you do. The reviews provide a catalog of what is possible at any given company rather than what is probable for you. Find out the success rate of your internship program. Gauge how it compares to others in your area or across the country. Find out if your prior interns actually learned something. SMNetwork has gone to all possible lengths to make sure reviews are 100% objective. Reviews are patrolled by a trusted staff of neutral stage managers to weed out dishonesty and fake data. All reviews are the property of their respective contributors and are not edited or altered by SMNetwork's staff before publication. Help out the next generation of stage managers by contributing your reviews of prior internships. Reviews can be publicly associated with your SMNetwork account or anonymized for your protection. Reviews of internships from any point in your career are welcome, although only internships completed during the past five years contribute to a company's rank in our system. At this time we are only accepting reviews of internships within the United States.